Maedeup, the traditional Korean knot, developed into a distinctive decorative art and practical use through its long history. It was used in not only fashion, household and ritual items but also court ceremonies, the lives of the common people. It was also used to adorn musical instruments, fans, dresses, flags and palanquins. Today, knots are widely used as modern ornaments in accessories and for art. 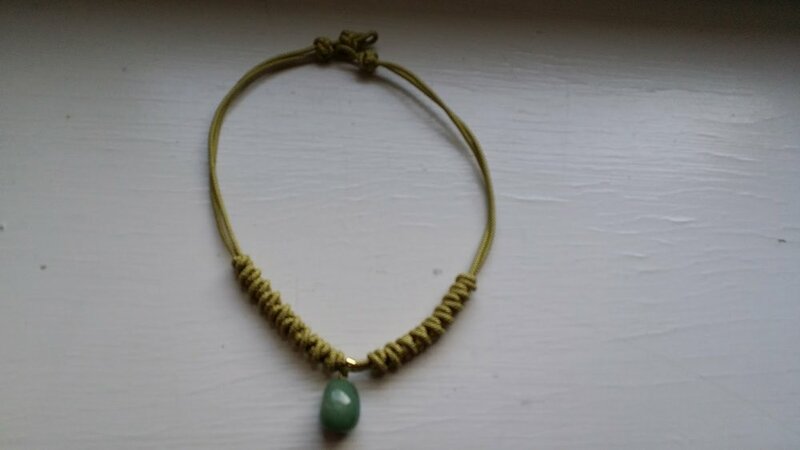 In this session, you will learn to make a necklace like the one shown. All materials will be provided. COST: $25 members, $30 non-members. Take both this and the bracelet class on April 19 for only $40 members, $50 non-members! RSVP: Send payments via https://www.paypal.me/alsoknownas. Please indicate what you are paying for on the form! After payment, please send a note to Michael Mullen for the location. KumJoo Ahn is a world-renowned textile artist of bojagi (Korean wrapping cloth), hand-embroidery, and Asia knots. Her works have been exhibited in Peabody Essex Museum, K&P Gallery, Neiman Marcus, Englewood public library, Fort Lee public library, Gallery Bennett, Korean Community Center in New Jersey, Korea plaza, Korean embassy in Malaysia, Laporte peinte, the gallery at the Blue House, Korea, Kyoungin Gallery, Seoul History Museum, Songpa Library, Training Center for Important Intangible Cultural Properties. She has given trainings to over 500 students in Korea, USA, Malaysia and France over 15 years. She awarded at the first cultural products of sewing in 2005, at the second KDB traditional craft arts products contest and a market place by KDB Bank, Korea in 2013 and at the 39th Korea Annual Traditional Handicraft Art Exhibition by the important intangible Cultural Properties in 2014. Adoptee Forum: You reunited with your birth family... now what?